The rains returned to south Texas on Thursday. I had a rough week coming back from the old fashioned throw-up and die stomach flu. I was back at work Wednesday but so weak I could not make my usual walks. We were due to cut hay on Thursday. I was surprised at the farmer’s timing with the rain headed in but figured he knew more about the weather than I. What I did know was I was hardly keeping one foot in front of the other and the thought of stacking hay from the field to the barn was more than I could bear. Lauren was keeping track of the progress of the hay as I made my way home, running directly into the line of storms. Lauren reported the hay bales were finally hitting the ground. Our friend Gaylyn was coming to get her hay and help us. Then Lauren reported they had stopped baling. Apparently the baler was broken. The rain was coming. We had worked to empty our old garage and our barn hay room so we could hoard hay for the winter. We had planned to put up over 100 bales. As I got home, I called the hayman for an update. He confirmed the baler was broken and now he would be baling round bales (lower quality hay wound into a huge ball like yarn). The round bales (especially after sitting in the rain soaked field) would not be horse quality, nor would we be able to store and manage the giant bales in any case. There would be no hay for us this winter from these fields. I have several friends that have come to depend on this hay. It was a huge blow to see the hay go unbaled in the driving rain. As the rain descended into Friday, we had not a single bale of hay in the barn, as we had been counting on the fresh hay. Lauren scrambled to go pick up a few bales of hay before the route to the barn became too waterlogged. Snowboy left on his own in enclosed section of the barn. I got home Friday after visiting my mom, to see Snowboy standing in the front covered portion of the barn. Lauren was at Blake’s helping him celebrate his birthday. Kid goes out in this area every night. Lauren figured Snow would just clean up the dropped hay and get some time out of his stall. Check out the scene I saw as I got to the barn. 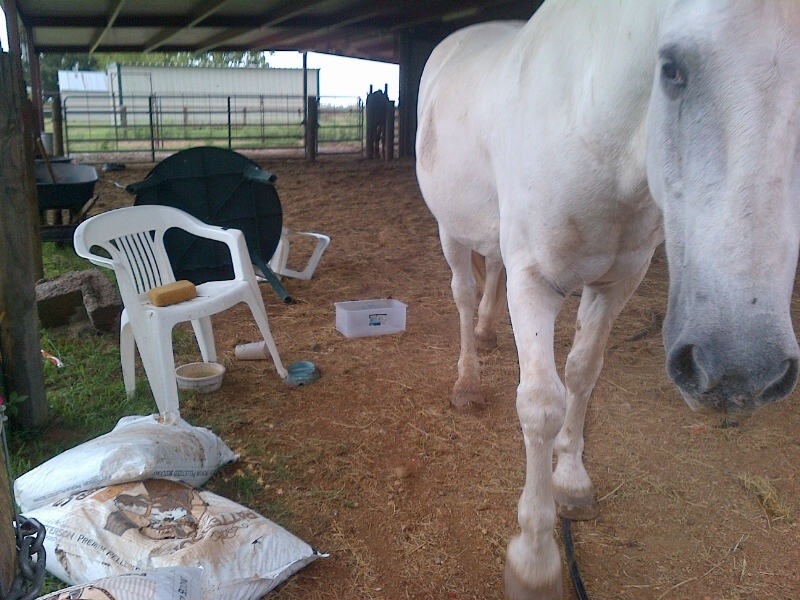 Note the round, turned over table, the chairs setting on edge, the bags of shavings ripped open and the empty plastic bin. That bin had been full of cat food. Now Snow was full of cat food! What a mess! Boy, he had cleaned up alright. Every edible morsel of food was gone. 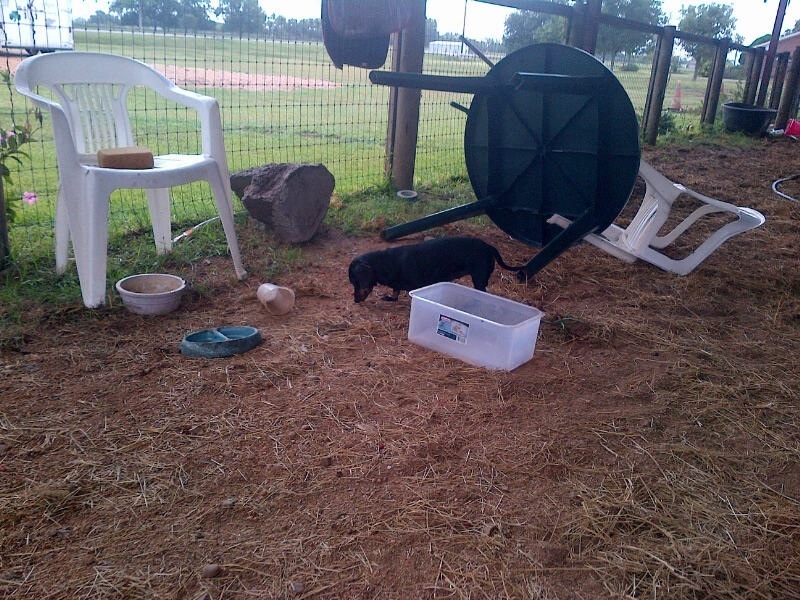 It looked like Hurricane Snow had come through the barn. Note to self-Mr. Kid is the only horse allowed in the space in front of the stalls. I am pleased that our roof we added last spring, which has not seen a strong storm, really helped keep our stalls and horses dry. Also, those additional loads of rock, gravel and sand kept the pasture pathways high and dry so the horses were back out of their stalls this morning. There is always more we can do, but the little ranch came through the rain in better shape than ever before. Step by step, we make our way.